This announcement on the Government web site is entitled Put HS3 at the heart of a High Speed North – Adonis. Recommendation six: Proposals for the redevelopment of Manchester Piccadilly station should be prepared jointly by TfN, Transport for Greater Manchester, Manchester City Council, Network Rail, DfT and HS2 Ltd.
c) Proposals for funding and financing the station redevelopment, including for private sector and local contributions. I know Manchester Piccadilly station well and it has multiple space problems. These pictures illustrate some of the problems on the North side of the station. You have lots of short trains and long platforms, which means the following. Passengers have to walk long distances. There is confusion of which train to take with more than one in the platform. It must be a nightmare for train operators and their staff. Surely some reorganisation could improve this mess, that was probably designed by Topsy. On the South side of the station, there are two of the most crowded platforms in the UK. Platforms 13/14 need a serious sorting out. Currently, services from Platform 13 seem to go to the following. And from Platform 14 to the following. Most of the services seem to be provided by TransPennine Express and I think it is true to say, that when and if the Ordsall Chord is opened, there will be a sorting out of services on these two platforms. But I do feel that the solution is Network Rail’s preferred one of adding platforms 15/16. They can’t be built soon enough, to ease the overcrowding. 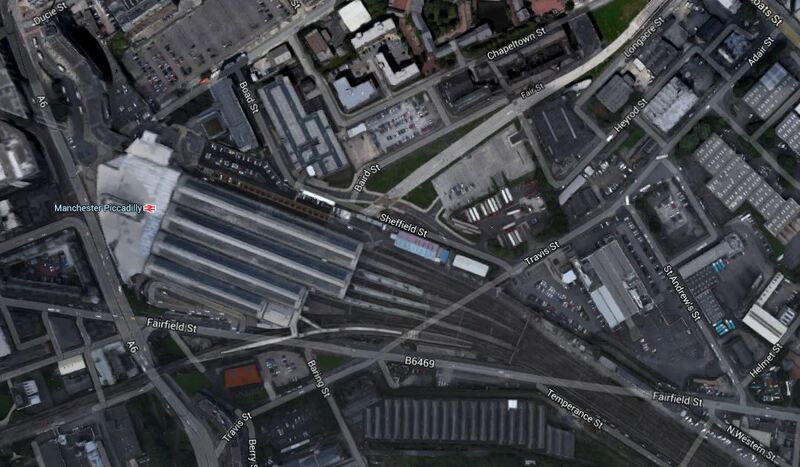 This Google Map shows the layout of Manchester Piccadilly station. The current Platforms 13/14 are along the bottom of the station, connected to the main station by the two small bridges. I would assume that the two new platforms will go on the south side of 13/14. Wikipedia gives more details of developments related to the Northern Hub and HS2. It is going to be a tight fit to get all the lines and platforms into the area. The more I look at the station, the more I tend to think that the Picc-Vic Tunnel might have been a good solution. It makes me wonder if it would be more efficient for HS2 and HS3 to share a route through Manchester from the Airport to Victoria and on to Huddersfield and Leeds. It would need to be mainly in tunnel and could go right under the city with underground stations. I wrote about it in Rethinking HS2 And HS3. 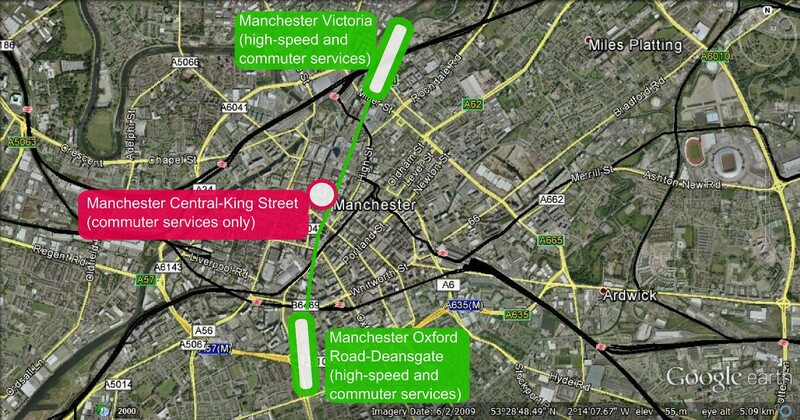 Surely, if two high speed lines are to go through Manchester, they should share a route? I have also received this image from a reader; Ben. Ben’s plan illustrates some advantages of a cross-city tunnel, which probably include. Less demolition at stations served by HS2. HS2 and HS3 could probably share platforms. Release of platforms at Piccadilly. A station in the centre of the city. Ability to continue in tunnel towards Huddersfield and Leeds. Remember that we’ve improved our tunnelling capability by a large amount in recent years. Crossrail in London has also developed station designs and layouts, that could be used in Manchester. Massive double-ended stations to effectively serve two separate locations. Lines and station layouts to ease and encourage same platform interchange. Moving walkways and inclined lifts, where necessary to ease passenger movement. Island platforms to ease interchange between directions and branches, as at Whitechapel. So could the most passenger friendly station, just called Manchester, be built under the city? I don’t think that the current plans for Piccadilly, which are just so much conservative dross will be realised, as someone will come up with something much better. But then recommendation six encourages that!